Dr. John Landgraf began his career in dentistry over 35 years ago, when he worked as a dental laboratory technician making crowns and dentures for dentists. In dental practice for over 25 years, Dr. Landgraf remains on top of his profession in order to provide patients the best dental care available. 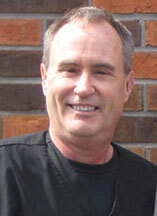 An honors graduate of Washington University School of Dental Medicine, he is also a past instructor in the University’s Department of Operative Dentistry. Dr. Landgraf is able to offer his patients the best options because he completes more than twice the required continuing education for licensure each year. He is also a member of local study clubs, which provide professional forums to explore developments in the dental field. Dr. Landgraf is an active member of the American Dental Association, the International Association of Orthodontics, and the Academy of General Dentistry. He also volunteers as a staff dentist at the Community Health in Partnership Services (CHIPS) Clinic and as an educator to train and certify dental assistants performing expanded dental functions. Patients can feel confident that Dr. Landgraf possesses the background, the experience, and the passion to provide the best available dental care.